The Finance Minister’s recent press statement contained the following: “Changes in the black working population and white population are indeed significant and are something of note.” This tidbit came after the Minister and his government found themselves under inordinate pressure to publicly release the recently completed Labour Force Survey for 2014. The survey itself which was compiled by the Department of Statistics had been essentially held hostage by the Minister and his colleagues since at least October of last year. And one got the distinct impression during the Finance Minister’s press conference that if they could have gotten away with not releasing the survey at all, they would have. It was also clear that while the facts are saying one thing; the OBA government and its surrogates over the last year or so have been saying something quite different – about the health of this economy. Nonetheless, the Minister was correct in highlighting the fact that increasingly Bermuda’s economy, continues to produce significant disparities between black and white. And these disparities have been exacerbated by a recession that the OBA has had no success in arresting. We need no more evidence of that than the fact that in 2014, not only did earnings fall but the survey indicates that the workforce shrunk by an extraordinary 511 persons. And the attrition continued last week with the news that American Airlines will shed fifteen Bermuda based employees. Even our once vaunted Re-insurance industry is not immune, as the recent XL-Catlin merger will also result in a reduction of local staffing levels. The Finance Minister is concerned and quite rightly about the relative changes to the black and white working populations. The survey starkly reveals for example that year over year that the black working population shrunk by an estimated 1,037 persons. By way of contrast, during the same period, the white working population saw an estimated 686 person increase in its numbers. Richards knows, as I do, that in a multi-racial society as ours is; that that stat along with others, conveys that we are like two ships going in opposite directions with respect to this economy. Let’s look at the unemployment figures. Firstly, the survey reveals that the black unemployment rate has reached record levels and now stands at 12%. Secondly, the white unemployment rate has increased as well, year over year from 2% in 2013 to 4% in 2014, as did those of other groups such as permanent residents. Yet, the black unemployment rate in Bermuda is still approx. three times the level of the white rate of unemployment. Notwithstanding the above, the overall unemployment rate now stands at 9%, its highest level ever in terms of recorded stats. As a political party we take no pleasure in the above. We have too many of our relatives and constituents who live in the real Bermudian economy who are either unemployed or underemployed. We also note that our young people need the opportunity to meaningfully start their working lives. Numerous studies have shown that young people who enter their most productive working years during a recession, and who experience mid to long term unemployment never really catch up later in life. In other words the loss of valuable experience, earnings and opportunity are never compensated for. Having said that, the youth unemployment level in the survey -characterized as those between the ages of 16-24 years of age – has essentially skyrocketed from 22% in 2013 to 29% today. Let’s hope that our government and our Finance Minister draw the proper lessons from this debacle. As to the development projects that the OBA has been touting – most of which still need to go through the lengthy planning process – our hope is that they will start to produce the type of good and well-paying jobs that are needed. We urgently need to restore economic growth to those who live in the real economy and once again engender amongst Bermudians a renewed sense of optimism about their futures. Certainly, as the Labour Force Survey now confirms, we have seen precious little of that of late. Oh, be quiet. The American Airlines situation, as well as the XL/Catlin merger have absolutely NOTHING to do with politics, government, etc. Any excuse to make noise and blow the race trumpet. Here’s an idea, Rolfe – how about those youth you speak about, some of whom probably make up a good number of the unemployed in their later years, actually WANT to learn, study, and put the effort in to make something of their lives? You using race as an excuse/crutch is getting really old, really fast. No one is entitled to anything these days – black, white, Bermudian, ex-pat, male, female. A little hard work and dedication go a long way. Yeah, young people need the opportunity, as you state above – but only if they bloody deserve it. You’re wasting your breath Kool, most of them have their entitlement headphones on, and DJ Rolfe is spinning the viynl! Wow…the hypocrites are out in force today. St Kool totally ignores the fact that his/her hero Bob Richards took note of the growing racial disparity as well in his statement and press conference. And there is such a thing as “colour blind racism” and frankly St. Kool you just may be a proponent of it. Commissiong was spot on this time. Let them keep running their mouths off ANONYMOUSLY like this is a joking matter and see if their still wise cracking when the ultimate implications of what these statistics point to rear their most unfortunate heads. Bermuda clearly has little tolerance at this point for the continued and widening disparity in fortune between one segment of this island and the other. Especially when its made so blatantly obvious in an information age. “The black unemployment rate has reached record levels and now stands at 12%. Black and mixed races represent the majority of the voters. It would make sense to have their support if you want to get elected again. There is some disparity in Bermuda. The figures speak for themselves. And do not realize the role the PLP played in increasing that disparity during their rule. From the moment they got in, in ’98, they allowed the public education system to crash down around a whole generation, virtually gave out work permits for unskilled jobs, created an environment that was seen as hostile to, by the IB community and were in power when our economy saw a reduction of, conservatively estimated, over 5000 jobs… yet Mr. Commissiong find it extrodinary that 500 were lost this year. It is especially disturbing, and a testament to why he shouldn’t be in government, that he did not see this rise coming given that the hospital project was due to end this year, with over 500 people employed to the construction there. Its sad when the people that don’t understand statistics well enough and, in turn, make this argument aren’t corrected by their OBA/UBP supporter brethren on their error. An unemployment RATE is a relative measure which means that if the number of whites on the island equaled the number of blacks then in absolute terms there would be 3 TIMES MORE BLACKS UNEMPLOYED THAN WHITES. That should help you to start seeing the issue for what it is. And its furthermore hardly shocking that the OBA/UBP mouthpieces that do know better put no effort towards acknowledging this OBVIOUS disparity, nor do they feel it warrants constructive dialogue. As I said, see what happens with time if folks keep playing dumb. You can’t just assume that if one number increased, everything else stays constant. That is a fools reasoning. Just like, if we increase payroll tax then we will get more money. Rolf , it was released earlier than last years was so where is the issue regarding timing? RC – BE QUIET! for Ch……t Sakes the Bermudian people know the deal! What real solutions do you or your political party have.— if the OBA is struggling to come up with any fast real solutions what chance do you have.—- just be quiet! but thanks for your Political Party for getting Bermuda in this mess in the first place. Your party’s Term Limits legislation drove a whole bunch of people off the island that employed the people who are now UNEMPLOYED. Now you are crying that it hurt black people more than white people?? Perhaps you should have thought a bit harder about the effects of your party’s policies back then? But no….you lot knew better. So why is the trend of job losses in the IB sector still ongoing? Are you really, AT THIS STAGE, foolish enough to believe [sincerely] this is about work permit policy!? Christ thats an old OBA line that isn’t even used anymore because of the generally recognized daftness of its pressumption! The losses in IB are resulting from mergers. That is when two companies merge together and jobs that overlap are made redundant. The work permit policy drove a bunch of IB companies OUT of Bermuda after it was implemented by the PLP. The first example is what is happening now. The massive reduction in jobs from 2008 – 2013 were due to the latter. The relatively small number of jobs lost recently the result of the former. Excuse me if I’m wrong Rolfe, but aren’t you part of the party that is currently throwing Craig Cannonier under the bus? So much for supporting the black man and Christian values. Black is a State Of Mind not just color, ever herd of an oreo? Everyone lives in the Real economy Rolf. Perhaps you don’t. Tell me again, what do you do for a living. Is it just feeding off the taxpayer teet? Be interesting to find out what all of them do for a living.Has this turned into a job for quite a few.We need to get back to reality where they were paid gas money.We really don’t need paid mp’s we have a civil service that are quite suited to run everything with tweaks from elected citizens on weekends from time to time. He refers to people working in the “real economy”, yet I don’t believe he works in the real economy. I don’t think we need as many MP’s as we have. I don’t think they need to earn as much money as they do, but that’s not the topic. You are right. Everyone lives it the real economy, though it is undeniable that one race clearly lives much more comfortably in it, despite being a minority on this island. Furthermore the ones that aren’t even born of this land whether have Bermudian status or not [yet], seem to live particularly comfortably in this real economy. I am so sick and tired of the BS that Commissiong spews out….please PLP.get rid of this guy.. Better talk to the voters in his constituency about that. The PLP could run a lump of coal in that area & the voters would elect it. Then why don’t you actually counter his comments with something that reduces them to nonsense. As opposed to perpetuating the perception people like you don’t like to hear the truth because it puts a dampener on your day. I reiterate… perception. I don’t even know why they get paid as one assumes they earn enough in there chosen fields. The private sector must create more jobs. Mr. Commissiong and others Stop blaming the Government and put your money where your mouth is and start up new a new bussiness that will create more jobs. Exactly!! Sadly, this is all we see from our PLP MP’s, opinion pieces and soundbites but no concrete action that will actually help Bermudians as a whole or even their target audience Black Bermudians. 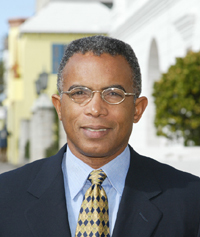 Very few PLP MP’s take a chance with their money and create significant or any employment in Bermuda for anyone. Clearly they prefer feeding from the trough rather than actually helping! I don’t think Mr. Commissiong has had a job that wasn’t paid by the taxpayers or friends in a long time, you can’t expect him to know how to create jobs. I don’t expect him or the aforementioned PLP MP’s to do anything other than what they are doing now. Namely continue feeding from the Trough, blaming everything on their favourite Bogeymen all while bemoaning the lack of opportunities that they helped to create. we have over 2 Billion in Debt from the previous administration and now paying 160Million dollars per year in interest on the Debt the PLP created. And how about the 10,000 work permits we have of folks from other countries working here in Bermuda?.. What is wrong with taking or getting qualified to assume one of those jobs. We have plenty of jobs and work in Bermuda….. DAH! ” A Wolfe in Sheep’s clothing”. Defining a person who is not what the appear to be. Amazing how all of those bleating on about the Wolfe’s comments [lol pun intended] have collectively managed to do NOTHING in the way of countering his points are even acknowledging the disparity between races regarding economic hardship. Christ its 2k15 not the 6os! what are you doing to change what you percieve? What are you doing to provide economic prosperity? Come on …lots of talk from you.